It’s not Snapchat, but Facebook is looking to step up its game in messaging by adding more features to the product it already has. 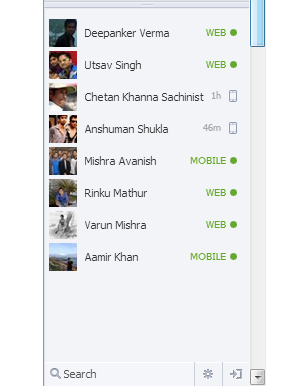 The social network is currently testing a new messaging feature that lets you know not just which friends are online at the same time as you are, but whether they are using the mobile or desktop version of Facebook. The additional details were first reported to us by Deepanker Verma, founder of the Techlomedia blog in India, who said his friend had spotted them first. He’s also pointed out that it appears to be a bit buggy. We reached out to Facebook who confirmed that this is something it is testing out. “We are testing a feature that gives you a better understanding of where your friend will receive your message,” a spokesperson said, who said she would keep us posted on when and if it rolls out more broadly. So why might Facebook be testing out new features? The idea of giving users information about what kind of devices their friends are using is, in a way, a throwback to the earlier days of messaging services that were built out for enterprises, when IT companies talked about “unified communications” and creating ways of letting people seamlessly integrate their mobile messaging and desktop messaging applications and services — partly so people stayed connected all the time, and partly so that they knew where their messages were ending up. While this kind of requirement isn’t as essential in the days of connected services that are almost always already available on both, or are strong enough on mobile that desktop access is unnecessary, you can see how some of the logic of knowing this information remains. Although our smartphones are becoming increasingly more computer-like in their functionality (and for many have replaced computers altogether), there is still a gap between how users interact with each other when they are on desktop versus when they are on mobile devices. Users who are mobile may give shorter replies, or they may be less likely to reply instantly if they are on the move. Those who are on desktop are more likely to be sitting down, and therefore have more time to read longer messages with links and media and reply to them. Facebook already provides some of this detail but in a different way: today if a user is sending a message from a mobile device, the recipient can see that detail on the message — information that some would prefer not to share. Putting “mobile” or “desktop” into the status window would pre-empt that information coming across in the message after the fact. That’s something that may lead to people using the platform to send more messages, since people are more inclined to send a message if they think they’ll get a quick response. These presence indicators make more it clearer someone is ready to reply. It could also be that Facebook is thinking more generally about ways that it might develop its messaging app going forward, to keep the product evolving. While services like Snapchat, Whatsapp and Line may still be far behind Facebook when it comes to monthly active users, Facebook is somewhat scrambling today in another race: the mindshare race. In that context, the rush to remain dynamic and full of new but simple features, which may catch the eye of users and get them to use the service a bit more, is not to be underestimated.